When asked if the CBYCC program helped her get the job she has today, Harmony Edmondson affirmed that it was indeed a stepping stone. “CBYCC introduced me to the tools, working on a crew, how that works and what that looks like,” she explains. She adds that it was a fundamental part of learning how to interact and cooperate with others. “We worked near the fish hatchery outside of East Kooskia, and we built the wood fence that’s out there right now. My crew built that!” Edmondson says it gives her a sense of pride when she sees the fence, knowing that she was able to contribute to her community. Edmondson is one of many Clearwater Valley area youth that participated in the Clearwater Basin Youth Conservation Corps (CBYCC). For eight weeks each summer, teens between the ages of 16 and 18 train to use tools and safety procedures to work and maintain access to recreation in their area, from weed-whacking to trail maintenance. Harmony Edmondson and her Kooskia 1 Crew in 2017 working on the fence near Kooskia National Fish Hatchery in Kooskia, ID. The Clearwater Basin Youth Conservation Corps is a more local program, but there are YCC programs all across the country. Spatial Analyst Sam Martin works for the Nez Perce-Clearwater National Forest Plan Revision Team out of Kamiah, Idaho, and participated in his local YCC program in 1987, working in the Lewis and Clark National Forest in Montana. 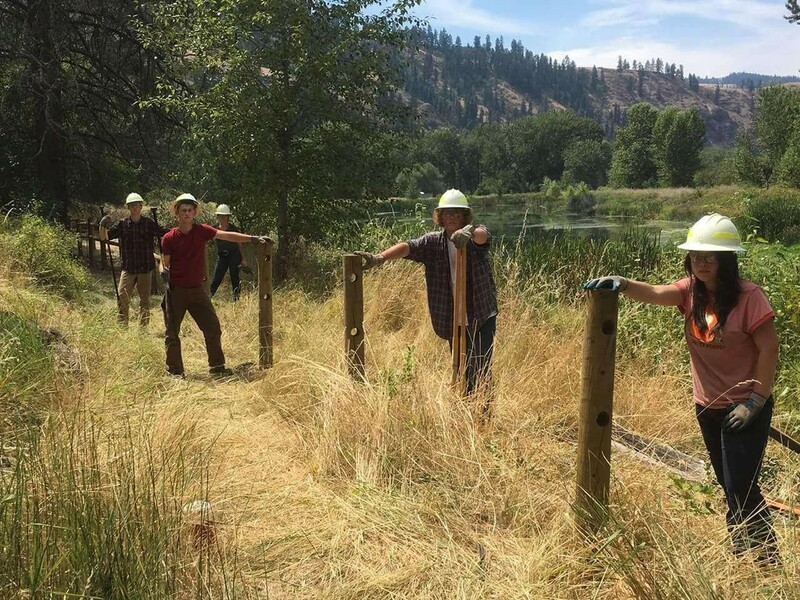 The Clearwater Basin Youth Conservation Corps provides job opportunities for youth in Orofino, Kamiah, Kooskia, Pierce, Grangeville, and Potlatch areas every summer, with more activities and projects planned for the 2019 season. CBYCC alumni Avery Proctor also used her experience as a launchpad for her career. She was introduced to the type of work necessary for natural resources, conservation, and land stewardship in the CBYCC program. Proctor says she gets to experience the duties of the timber crew, and is hoping to assist on the upcoming prescribed burns. “Right now I’m working as a firefighter at the Department of Lands in Kamiah,” says Proctor. “I’ve always just been an outdoorsy person.” Proctor made it clear that having a job in nature is a priority for her. Follow along with the Clearwater Basin Youth Conservation Corps on Facebook and Instagram to see project examples and job postings for the upcoming 2019 season. For more information about the CBYCC program, visit clearwaterbasincollaborative.org/cbycc and facebook.com/IdahoCBYCC. The Clearwater RC&D assists many bourgeoning collaborative groups and organizations throughout the region through fiscal sponsorship, an arrangement allowing groups such as the CBYCC to obtain grants and donations under a sponsor’s nonprofit status. This leaves the heavy paperwork, regulations, and requirements to the Clearwater RC&D, so individuals and organizations can focus on their projects. To learn more about the Clearwater Resource Conservation and Development Council and whether fiscal sponsorship could benefit your project or organization, contact Barbie Miller, Executive Director, at (208) 883-4471 or visit clearwaterrcd.org.